I've been crazy traveling this week, so haven't gotten to participate in BBAW beyond hugging bloggers at the Brooklyn Book Festival (Jaime of The Perpetual Page Turner, Lori of the The Next Best Book Club, Erica of The Olive Reader, Allie of Hist-Fic Chick, and Nicole of Linus' Blanket, among others), doing an interview swap and celebrating mightily when I heard that I had won both Best YA Blog and Best Author Interviews (I still can't quite believe it! Thank You!). So I am making up for that now, with a POWER BBAW post! 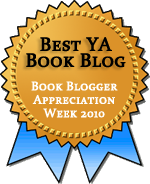 Since last year's BEA I've discovered a ton of fab new book blogs, but two of my favorites are blogs that were also shortlisted for Best YA Blog this year: Forever Young Adult and Angieville. I was in absolute heaven when I got to hang with Sarah of FYA and Angie of Angieville at Book Blogger Con this year. So. Much. Fun. Sarah and her 3 FYA partners in crime always amuse on their irreverent blog. I love the format of their book reviews - especially the bonus factors. My dream is to one day be invited to a FYA slumber party and play the Sweet Valley High board game with them (I'd even play Elizabeth *gasp*). I would of course also insist that Angie attend. Angie is so passionate about the books she reads, she makes me want to ditch my current read to pick up immediately whatever she's pushing. She's the one who got me (and many, many others) hooked on Gen (from Megan Whalen Turner's The Thief series). She even had the power to make me think more positively about Mockingjay, which let's face it, was a letdown. One of the best things about reading a lot of book blogs is being exposed to so many different kinds of books and genres. Earlier this year, I become aware that I wasn't reading that many books with POC characters - thanks to blogs such as Reading in Color, Color Online and Steph Su Reads. I looked around in my huge TBR and dug out Bleeding Violet by Dia Reeves. That has been one of my most interesting reading experiences of the year (read my review), and I owe it all to book bloggers. In my last post, I introduced the Nerds Heart YA finalists and picked a winner. Both of those books, Say the Word by Jeannine Garsee and Last Night I Sang to the Monster by Benjamin Aline Saenz deserve much wider audiences. 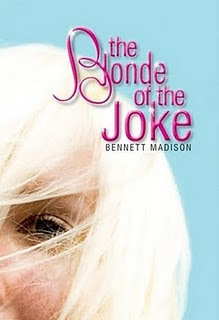 I nommed another book which didn't make it so far into the tournament, but was one I just loved: The Blonde of the Joke by Bennett Madison (read my review). It's a brilliant portrait of a complex, messy character. Goals? I gotta have goals? I guess my main goal for Presenting Lenore is to keep up my current level of quality while possibly spending less time on the blog and more time on my writing. I want to be able to abandon books more easily and not feel so guilty about doing so. I want to be more consistent about commenting, especially to encourage new bloggers. And most of all, I want to keep having fun, discovering new books, and sharing my love for literature. A huge thanks goes out to My Friend Amy and the rest of the BBAW team! Congrats again on your awards, and I think being able to abandon books more easily is a great goal! You are a total BBAW rock star this year!! Congratulations on your awards! I'm thrilled for you! Congrats on your awards! :) I also mentioned Angieville in my New Treasures post. So glad I found you this year. You deserve all this and more. Let us know about the Brooklyn thing! CONGRATULATIONS!!! Definitely well deserved. It's hard stepping away from the blog to concentrate on your own writing. My own blog has suffered (as you *may* have noticed) but it's all about priorities. Good luck with striking a balance. So great meeting you, too! It was seriously so much fun! Congratulations on your awards. Very well deserved. I agree with Amanda that abandoning books is a good goal. I have definitely been embracing that. Congrats! Looking forward to seeing you next week! Congrats to you on your wins!! Congrats on the much-deserved awards!! Congratulations on the wins! I think that they are well deserved! Congratulations Lenore. You deserve both of those awards. Congrats on your awards, Lenore!! Congratulations on the awards Lenore! Congratulations! I hope you meet your goals! Congrats to you!! I think I need to read THE BLONDE OF THE JOKE. that one looks very, very fabulous. 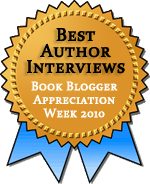 As a writer, I can tell you that your respect for authors is tangible in your interviews.